Ferdinand was the eldest surviving son of Charles IV of Spain and Maria Luisa of Parma. Ferdinand was born in the palace of El Escorial near Madrid. 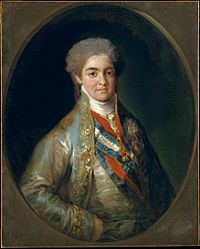 In his youth Ferdinand occupied the position of an heir apparent who was excluded from all share in government by his parents and their favourite advisor and Prime Minister, Manuel Godoy. National discontent with the government produced a rebellion in 1805. 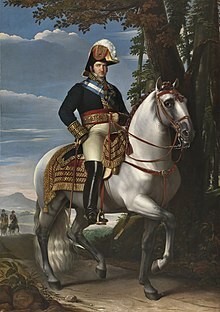 In October 1807, Ferdinand was arrested for his complicity in the El Escorial Conspiracy in which the rebels aimed at securing foreign support from the French Emperor Napoleon. When the conspiracy was discovered, Ferdinand submitted to his parents. 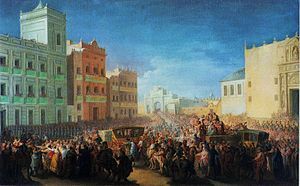 Following a popular riot at Aranjuez Charles IV abdicated in March 1808. Ferdinand ascended the throne and turned to Napoleon for support. He abdicated on 6 May 1808 and thereafter Napoleon kept Ferdinand under guard in France for six years at the Château de Valençay. Historian Charles Oman records that the choice of Valençay was a practical joke by Napoleon on his former foreign minister Talleyrand, the owner of the château, for his lack of interest in Spanish affairs. While the upper echelons of the Spanish government accepted his abdication and Napoleon's choice of his brother Joseph Bonaparte as king of Spain, the Spanish people did not. Uprisings broke out throughout the country, marking the beginning of the Peninsular War. Provincial juntas were established to control regions in opposition to the new French king. After the Battle of Bailén proved that the Spanish could resist the French, the Council of Castile reversed itself and declared null and void the abdications of Bayonne on 11 August 1808. 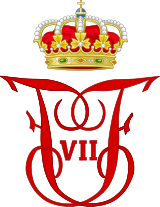 On 24 August, Ferdinand VII was proclaimed king of Spain again, and negotiations between the Council and the provincial juntas for the establishment of a Supreme Central Junta were completed. Subsequently, on 14 January 1809, the British government acknowledged Ferdinand VII as king of Spain. Five years later after experiencing serious setbacks on many fronts, Napoleon agreed to acknowledge Ferdinand VII as king of Spain on 11 December 1813 and signed the Treaty of Valençay, so that the king could return to Spain. The Spanish people, blaming the policies of the Francophiles (afrancesados) for causing the Napoleonic occupation and the Peninsular War by allying Spain too closely to France, at first welcomed Fernando. Ferdinand soon found that in the intervening years a new world had been born of foreign invasion and domestic revolution. In his name Spain fought for its independence and in his name as well juntas had governed Spanish America. Spain was no longer the absolute monarchy he had relinquished six years earlier. Instead he was now asked to rule under the liberal Constitution of 1812. Before being allowed to enter Spanish soil, Ferdinand had to guarantee the liberals that he would govern on the basis of the Constitution, but, only gave lukewarm indications he would do so. On 24 March the French handed him over to the Spanish Army in Girona, and thus began his procession towards Madrid. During this process and in the following months, he was encouraged by conservatives and the Church hierarchy to reject the Constitution. On 4 May he ordered its abolition and on 10 May had the liberal leaders responsible for the Constitution arrested. Ferdinand justified his actions by claiming that the Constitution had been made by a Cortes illegally assembled in his absence, without his consent and without the traditional form. (It had met as a unicameral body, instead of in three chambers representing the three estates: the clergy, the nobility and the cities.) Ferdinand initially promised to convene a traditional Cortes, but never did so, thereby reasserting the Bourbon doctrine that sovereign authority resided in his person only. Meanwhile, the wars of independence had broken out in the Americas, and although many of the republican rebels were divided and royalist sentiment was strong in many areas, the Manila galleons and the Spanish treasure fleets - tax revenues from the Spanish Empire - were interrupted. Spain was all but bankrupt. Ferdinand's restored autocracy was guided by a small camarilla of his favorites, although his government seemed unstable. Whimsical and ferocious by turns, he changed his ministers every few months. "The king," wrote Friedrich von Gentz in 1814, "himself enters the houses of his prime ministers, arrests them, and hands them over to their cruel enemies;" and again, on 14 January 1815, "the king has so debased himself that he has become no more than the leading police agent and prison warden of his country." The king did recognize the efforts of foreign powers on his behalf. As the head of the Spanish Order of the Golden Fleece, Ferdinand made the Duke of Wellington, head of the British forces on the peninsula, the first Protestant member of the order. During the aftermath of the Mexican War of Independence, the general of the army of the three guarantees, Agustin de Iturbide, and Jefe Superior Juan O'Donojú, signed the Treaty of Cordoba, in which concluded the war of the independence and established the Mexican Empire, and intended to offer the Mexican Imperial Crown to Ferdinand VII, in which he'd rule as a personal union, but unfortunately, he decreed that it was "void" and stated that no European can accede the Mexican throne. In 1820 a revolt broke out in favor of the Constitution of 1812, beginning with a mutiny of the troops under Col. Rafael del Riego. The king was quickly taken prisoner. Ferdinand had restored the Jesuits upon his return, but now they had become identified with repression and absolutism among the liberals, who attacked them: twenty-five Jesuits were slain in Madrid in 1822. For the rest of the 19th century, expulsions and reinstatements of the Jesuits would continue to be the hallmarks of liberal and authoritarian political regimes, respectively. At the beginning of 1823, as a result of the Congress of Verona, the French invaded Spain, "invoking the God of St. Louis, for the sake of preserving the throne of Spain to a descendant of Henry IV, and of reconciling that fine kingdom with Europe." When in May the revolutionary party carried Ferdinand to Cádiz, he continued to make promises of amendment until he was free. When Ferdinand was freed after the Battle of Trocadero and the fall of Cádiz, reprisals followed. The Duke of Artois made known his protest against Ferdinand's actions by refusing the Spanish decorations Ferdinand offered him for his military services. During his last years Ferdinand's political appointments became more stable. The last ten years of reign (sometimes referred to as the Ominous Decade) saw the restoration of absolutism, the re-establishment of traditional university programs and the suppression of any opposition, both of the Liberal Party and of the reactionary revolt (known as "War of the Agraviados") which broke out in 1827 in Catalonia and other regions. As Ferdinand lay dying, his new wife, Maria Christina of Bourbon-Two Sicilies had him set aside the Salic Law which would have made his brother Don Carlos heir to the throne instead of any female. Ferdinand was thus succeeded by his infant daughter Isabella II. Carlos revolted and said he was the legitimate king. Needing support, Maria Christina (as Regent for her daughter Isabella) turned to the liberals. She issued a decree of amnesty on 23 October 1833. Liberals who had been in exile returned and dominated Spanish politics for decades, and the Carlist Wars resulted. Ferdinand VII was married four times. In 1802 he married his first cousin Princess Maria Antonietta of the Two Sicilies (1784–1806), daughter of Ferdinand I of the Two Sicilies and Marie Caroline of Austria. There were no children, because her two pregnancies (in 1804 and 1805) both ended in miscarriages. 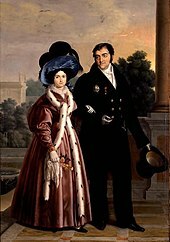 In 1816, Ferdinand married his niece Maria Isabel of Portugal (1797–1818), daughter of his older sister Carlota Joaquina and John VI of Portugal. She bore him two daughters, the first of whom lived only five months and the second of whom was stillborn. In 1819, Ferdinand married Princess Maria Josepha Amalia of Saxony (1803–1829), daughter of Maximilian, Prince of Saxony and Caroline of Bourbon-Parma. No children were born from this marriage. Lastly, in 1829, Ferdinand married another niece, Maria Christina of the Two Sicilies (1806–1878), daughter of his younger sister Maria Isabella of Spain and Francis I of the Two Sicilies. She bore him two surviving daughters, the older of whom succeeded Ferdinand upon his death. Madrid El Escorial Stillborn; Maria Isabel died as a result of her birth. Paris El Escorial Princess of Asturias 1830–1833, Queen of Spain 1833–1868. Married Francis, Duke of Cádiz, had issue. Seville El Escorial Married Antoine, Duke of Montpensier, had issue. This article incorporates text from a publication now in the public domain: Chisholm, Hugh, ed. (1911). "Ferdinand VII". Encyclopædia Britannica. 10 (11th ed.). Cambridge University Press. pp. 267–268. ^ Oman, Charles (1902). A History of the Peninsular War. 1. Oxford: Clarendon Press. p. 56. ^ "¿Por qué firmaron Iturbide y O'Donojú los Tratados de Córdoba?". www.milenio.com. Retrieved 4 February 2019. ^ A. W. Ward; G.P. Gooch (1970). The Cambridge History of British Foreign Policy 1783-1919 (reprint ed.). CUP. pp. 186–87. ^ John Van der Kiste (2011). Divided Kingdom: The Spanish Monarchy from Isabel to Juan Carlos. History Press Limited. pp. 6–9. Wikimedia Commons has media related to Ferdinand VII of Spain.